North Vancouver, B.C., November 10, 2017. Lion One Metals Limited (TSX-V: LIO) (ASX: LLO) (OTCQX: LOMLF) (FSX: LY1) (the “Company”) is pleased to announce the appointment of Mr. Tony Young as the Company’s new Chief Financial Officer, replacing Ms. Samantha Shorter. Mr. Tony Young has over 17 years’ experience in financial roles for mining companies operating in both Canada and Latin America. Mr. Young was most recently the Director of Finance at Red Eagle Mining Corporation, where he guided the company’s transition from mine development to production, including the construction of a 1,200 tonne per day processing plant at the San Ramon gold mine in Colombia. Mr. Young was also the Corporate Controller for Luna Gold Corp. (Trek Mining Inc.), an 80,000 ounce per year gold producer with a 6,000 tonne per day processing plant in Brazil. Mr. Young was previously Senior Manager at KPMG LLP providing assurance and tax services to mining and resource-based companies in Canada. Mr. Young is a Chartered Professional Accountant and Certified Public Accountant (Illinois) and holds a Bachelor of Commerce from the University of British Columbia. Lion One is aggressively advancing its 100% owned Tuvatu Gold Project as a world class discovery and near-term production opportunity in the southwest Pacific Ring of Fire. 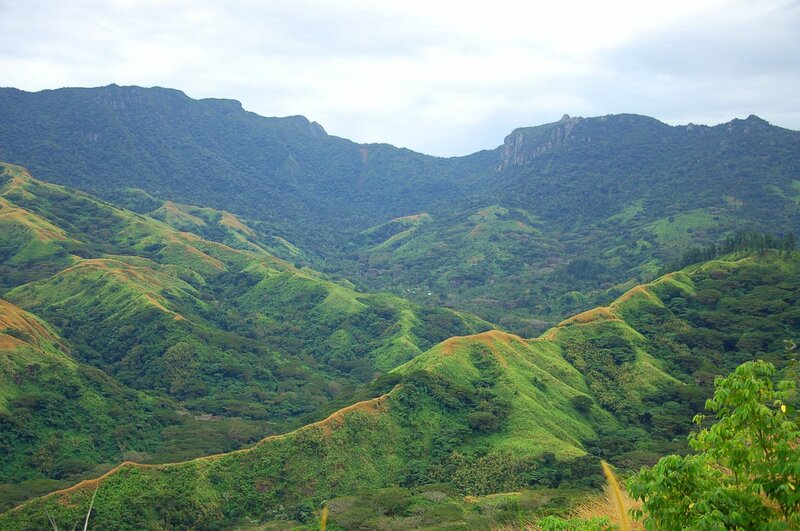 Tuvatu is modeled for exploration after regional giants in the low sulphidation family of high grade epithermal gold deposits such as Porgera and Lihir in PNG, and Vatukoula in Fiji. These spectacular discoveries have produced over 35 million ounces of gold in similar alkaline volcanic settings. Tuvatu has been fully permitted by the Government of Fiji for operations startup and has a dual-track strategy of production development and resource expansion inside its 385 hectare mining lease. Tuvatu is located 25 km from the international airport in Nadi, on the west coast of Viti Levu in the Republic of Fiji. Lion One’s CEO Walter Berukoff is leading an experienced team of mine builders, and has owned or operated over 20 mines in 7 countries. As the founder and former CEO of Miramar Mines, Northern Orion, and La Mancha Resources, Walter is credited with building over $3 billion of value for shareholders. Tuvatu was advanced by previous owners through underground exploration and development from 1997 through to the completion of a feasibility study in 2000. Acquired by Lion One in 2011, the project has over 110,000 meters of drilling completed to date in addition to 1,600 meters of underground development. In January 2016 the Hon. Prime Minister of Fiji, Mr. V. Bainimarama, formally presented the previously granted Tuvatu Mining Lease to Lion One. This concluded the permitting process for the development of an underground gold mine and processing plant at Tuvatu, demonstrating strong government support for Fiji’s 85 year-old gold mining industry. As per its independent June 1, 2015 NI 43-101 PEA Technical Report on the Tuvatu Gold Project, the Company envisages a low cost underground gold mining operation producing 352,931 ounces of gold at head grades of 11.30 g/t Au over an initial 7 year mine life. This includes production of 262,000 ounces at 15.30 g/t through to the end of year three. Estimated cash cost is US$567 per ounce with all-in sustaining cost of US$779 per ounce. Total capex of US$48.6 million includes a contingency of US$6.1 million with an 18 month preproduction schedule and 18 month payback on capital. At a US$1,200 gold price, the project generates net cash flow of US$112.5 million and an IRR of 52% (after tax). The Company is not basing its production decision on a feasibility study of mineral reserves demonstrating economic and technical viability; as a result, there is increased uncertainty and economic and technical risks associated with its production decision. Ian Chang, M.A.Sc., P.Eng., Chief Development Officer, is the Qualified Person (“QP”) responsible for Tuvatu Mine development. For more information on Lion One including technical reports please visit the Company’s website at www.liononemetals.com or the SEDAR website at www.sedar.com . This press release may contain “forward-looking information” within the meaning of applicable Canadian securities legislation. All statements, other than statements of historical fact, included herein are forward looking information. Generally, forward-looking information may be identified by the use of forward-looking terminology such as “plans”, “expects” or “does not expect”, “proposed”, “is expected”, “budget”, “scheduled”, “estimates”, “forecasts”, “intends”, “anticipates” or “does not anticipate”, or “believes”, or variations of such words and phrases, or by the use of words or phrases which state that certain actions, events or results may, could, would, or might occur or be achieved. 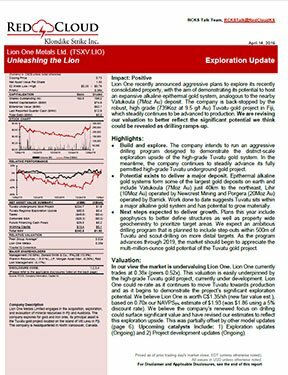 This forward-looking information reflects Lion One Metals Limited’s current beliefs and is based on information currently available to Lion One Metals Limited and on assumptions Lion One Metals Limited believes are reasonable. These assumptions include, but are not limited to, the actual results of exploration projects being equivalent to or better than estimated results in technical reports, assessment reports, and other geological reports or prior exploration results. Forward-looking information is subject to known and unknown risks, uncertainties and other factors that may cause the actual results, level of activity, performance or achievements of Lion One Metals Limited or its subsidiaries to be materially different from those expressed or implied by such forward-looking information. Such risks and other factors may include, but are not limited to: the early stage development of Lion One Metals Limited, general business, economic, competitive, political and social uncertainties; the actual results of current research and development or operational activities; competition; uncertainty as to patent applications and intellectual property rights; product liability and lack of insurance; delay or failure to receive board or regulatory approvals; changes in legislation, including environmental legislation, affecting mining, timing and availability of external financing on acceptable terms; not realizing on the potential benefits of technology; conclusions of economic evaluations; and lack of qualified, skilled labor or loss of key individuals. Although Lion One Metals Limited has attempted to identify important factors that could cause actual results to differ materially from those contained in forward-looking information, there may be other factors that cause results not to be as anticipated, estimated or intended. Accordingly, readers should not place undue reliance on forward-looking information. Lion One Metals Limited does not undertake to update any forward-looking information, except in accordance with applicable securities laws.